Kanaval Comes to Kay St. Germaine! 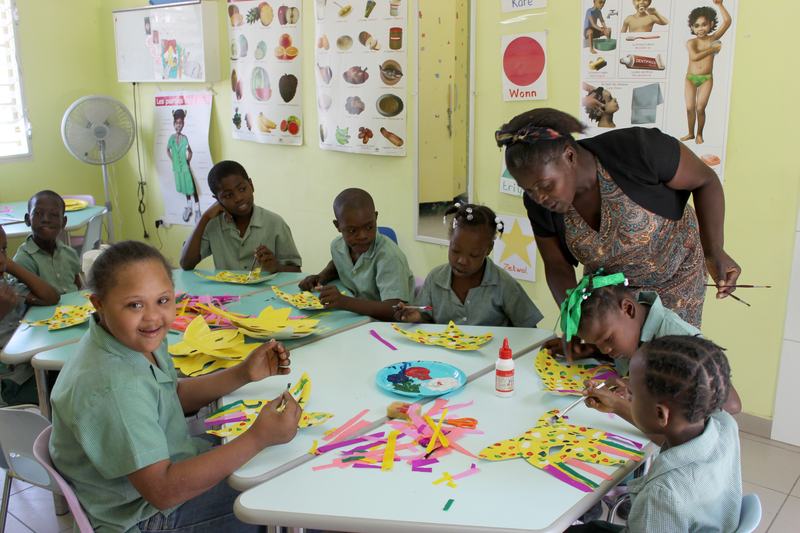 This past week at St. Germaine School, the staff and students worked diligently to prepare for the biggest party of the year here in Haiti-KANAVAL! This is a huge event in Haiti and celebrated throughout the Caribbean and the Americas. It is traditionally celebrated the three days before the start of Lent and is a time of celebration prior to the 40 days of fasting and solemnity. Professor Delicarme preparing Kanaval Masks with her class. Our students enhanced their academic skills through incorporating music, dance, costumes, and rhythms into class lessons. Each student prepared a decorative mask, hat, or costume. Our staff enthusiastically prepared our students for our big celebration. Children arrived decked out in colorful costumes, and many brought their families. Teachers and assistants helped the students put on their masks, hats, and costumes, and put festive makeup and glitter on their faces. 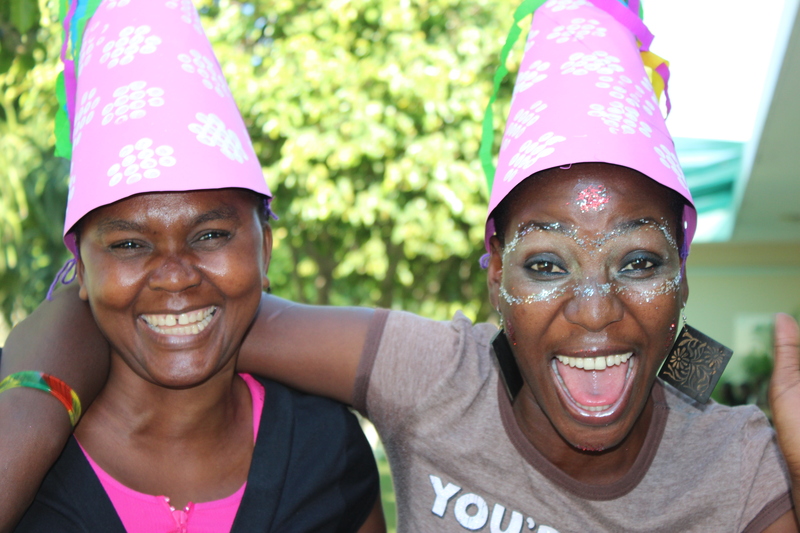 Marie Danielle and Jeta in the party mood (classroom assistants). It wouldn’t be a Caribbean Kanaval without the sun! The weather was also perfect for this celebration, with clear skies and warm temperatures. 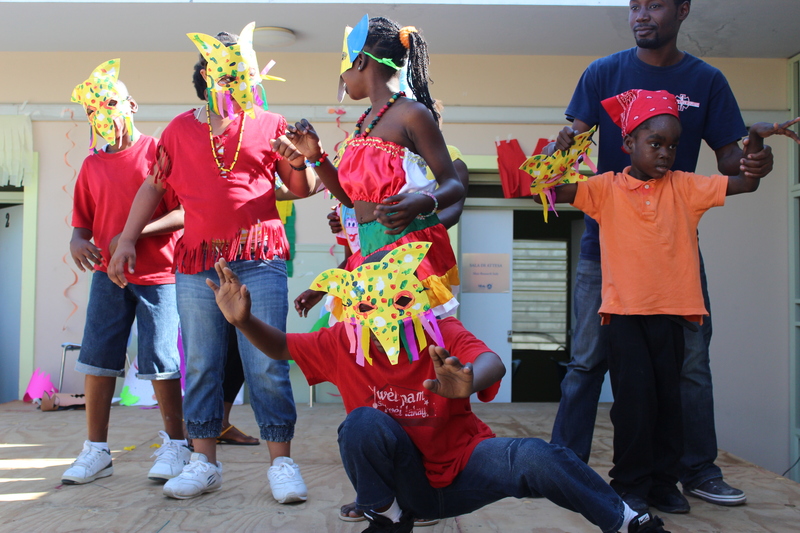 The teachers also got in the Kanaval spirit by putting on makeup and handmade costumes and hats. Max and Sadrak our accounting staff played MC and DJ- pumping out popular Kompa, Rara, and Kanaval tunes, which Haitians seem innately able to dance to! Despite the phycial limitations of our students, all present jammed out in their own fashion. Smiles were on every face! A stage was constructed the day prior to our celebration and our students were not shy to show off their moves. Each class performed a song or dance with the help of teachers and assistants. After the class performances, the students were able to dance free-style on the stage to much applause! A wonderful time was had by all, as you can see by the photos. Contributed by Kristine Cronin, Volunteer.